On their tour of the Grand Duchy's 15 Centre de Développement et d'Attraction (CDA), Hereditary Grand Duke Guillaume and Hereditary Grand Duchess Stéphanie visited Clervaux in the north of the country yesterday. The couple has previously visited Mersch, Vianden, Echternach, Redange, Dudelange and Esch-sur-Alzette. Stéphanie's and Guillaume's visit, however, did not start in Clervaux initially but Marnach nearby. There, the couple was welcomed by ministers Octavie Modert, Marco Schank and Martine Hansen as well as mayor Emile Eicher before visiting the Cube 521. At the cultural venue they viewed the exhibition "Aspects de l'art ardennais 1806-2013". Afterwards, they made their way to Clervaux. On their way they also saw and learned about the wind farm in Heinerscheid, the Château d'Urspelt and the school and sports centre in as well as the history of Reuler, a village in the commune of Clervaux. 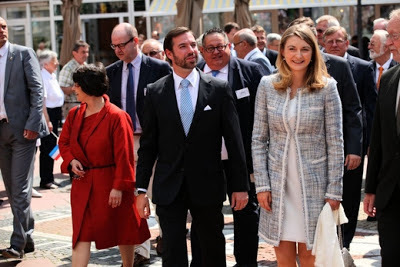 At the actual destination of their visit, the Hereditary Grand Duke and the beautiful-looking Hereditary Grand Duchess were welcomed by crowds of people when they walked through the town to the central market square. Subsequently, a few minor items on the agenda, such as a musical interlude by the pupil of the local primary school, were then crossed of the list. Their time in Clervaux ended with a visit to the local castle where they reopened and toured the "The Family of Man" exhibition by the late Luxembourgish-born American photographer Edward Steichen. Interesting side fact: between 1631 and 1856 the Château de Clervaux was owned by a branch of the Lannoy family so for Hereditary Grand Duchess Stéphanie it was also a tour into her family's history. Pictures can be found at RTL, Wort in German, Wort in French, Wort in English and Tageblatt.